When people ask me about what my blog is about, I say that it is a lifestyle blog. I say that because I share about my farm, I share about my family, I share about living in North Iowa, I share about different causes and organizations, I share recipes, and then sometimes I just share. I feel like my blog can't be just nailed down into one category, so I put it in the category of lifestyle because I'm truly sharing about my life! Harvest of Thanks to our Farm Family: This post not only shared a recap on this fall's harvest, but it also introduced you to some members of our "farm family". We wouldn't be able to accomplish everything on our farm without help, and in this post I introduce you to three of our helpers. 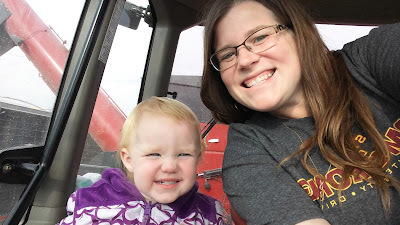 I also share that we are a finalist for the Iowa Young Farmer Achievement Award in this post and I'm excited to report that we won this award and now will be representing Iowa in the national contest next month! Knee High by the 4th of July: Every year we take a family photo next to one of our corn fields for our annual "Knee High by the 4th of July" photo. This post is always a favorite of mine and obviously for my readers too. Check out our "over head high" corn from this past 4th of July. 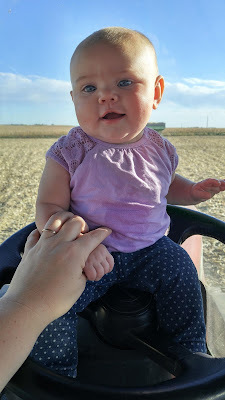 What it means to be a FarmHer: This is a post I wrote this fall in response to a conversation I had in the grocery store. I am proud to be a woman farmer and I'm working hard, along with others, to ensure that my daughters can be women in agriculture too. 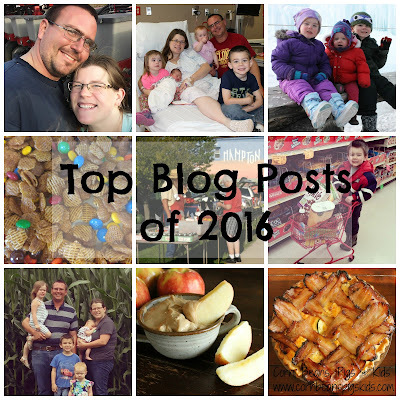 A Week's Worth of Blessings: My top family post was the post I wrote after our youngest, Miss R was born. This was obviously a highlight of our family's year, so it makes me smile that this post is the top family post of the year. Back to School Farm Kid Style with Carhartt: I had a lot of fun partnering with Carhartt this summer to share their new line of children's backpacks. Mr. K loves his Carhartt backpack and had a lot of fun helping me write a review for this post and giveaway. 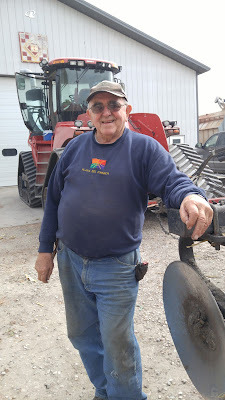 When I Grow Up I Want To Be A Farmer: My next top family post also involves Mr. K. In honor of National Ag Day this Spring, I interviewed him on why he wants to be a farmer when he grows up. This post makes me smile so much. It's a lot of fun to take a look through a 5 year old's eyes on what being a farmer means. 5 Family Winter Fun Activities in North Iowa and Beyond: It probably isn't a secret, but I actually love the winter time! There are so many great activities my family enjoys going to during the winter in our home area that I wrote a post about our favorites, so hopefully more people would enjoy and embrace the fun that winter brings to North Iowa! Farmers Market Quiche: This post could have fallen under a couple of categories but I decided to include it in my top North Iowa posts because it shares about my local Franklin County Farmers Market. I love going to our local Farmers Market as much as possible during the summer and in this post I also share a delicious quiche I made with some of the fresh produce I picked up. I actually made this quiche just last week for Christmas Eve brunch and it was a hit with our extended family! Oh, what I'll do for charity - Cupid's Undie Run: This post recapped my first experience running in my underwear for the Cupid's Undie Run this past February in Mason City. I must have had a lot of fun, or I'm crazy, because I'm signed up to do it again this February! 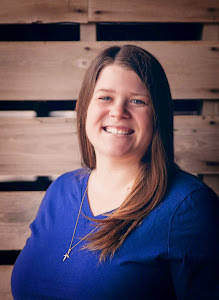 What it means to be a "Blue Family": This is a guest post that one of my younger sisters wrote as a support piece towards my Comments for a Cause efforts for Iowa C.O.P.S. This post has come into play a couple times I'm afraid this past year. I encourage you to take some time to read this post to better understand and have empathy to know what it means to be a police officer family. Lullaby Lane: Lullaby Lane was such a neat local project that raised money to create a prayer pathway and memorials for those who have had a miscarriage in North Iowa. I'm proud to say this project was completed in time for its dedication in October of this year on Pregnancy and Infant Loss Awareness Day. Back to School Caramel Crispix Mix: I literally hear from people each week that they have tried this recipe and now are addicted to it like my family and I. This is a great snack to make for any gathering. 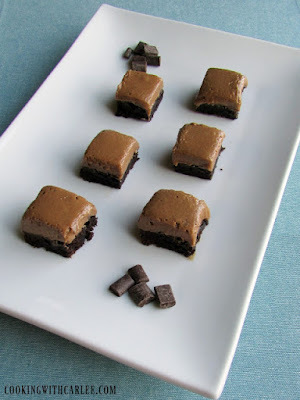 If you're having a kid-friendly New Year's get together (or even if it is adults only) you should make a batch! 3 Ingredient Strawberry Lemonade Sorbet: Everyone must have been looking for something simple and refreshing this summer because this 3 Ingredient Strawberry Lemonade Sorbet using AE Dairy's Reduced Sugar Lemonade fits that bill. Even though strawberries aren't in season, I'm thinking maybe I should get some frozen strawberries and make this soon! #AppleWeek 1 Minute Caramel Apple Dip: I had a lot of fun participating in Apple Week with some of my blogging friends this past September and my 1 Minute Caramel Apple Dip is my favorite recipe I shared. So simple, good, and obviously fast! The Influence of Millennials on Food Trends: This Winter I was interviewed for an article on the topic of millennials and their influence on food trends. As both a millennial and farmer I found this topic very interesting. In this blog post I shared some of my thoughts from the article and more, and I guess my readers found the topic interesting too since it was my top viewed "other" post from the year. New Year Goal - Making a Daily Routine: What a great post to revisit just a couple days til the start of 2017. I have to admit, I went through waves of being really good at my daily routine and times of just flying through doing whatever needed to be done. I always feel better myself when I can do my daily routine and I plan on concentrating on this again in the New Year. 5 Gardening Tips for Beginners: I think more and more people are interested in planting their own garden every year, but a lot of times they don't know where or how to start. I put together several tips for beginners so hopefully their first garden won't overwhelm them and be successful at the same time. 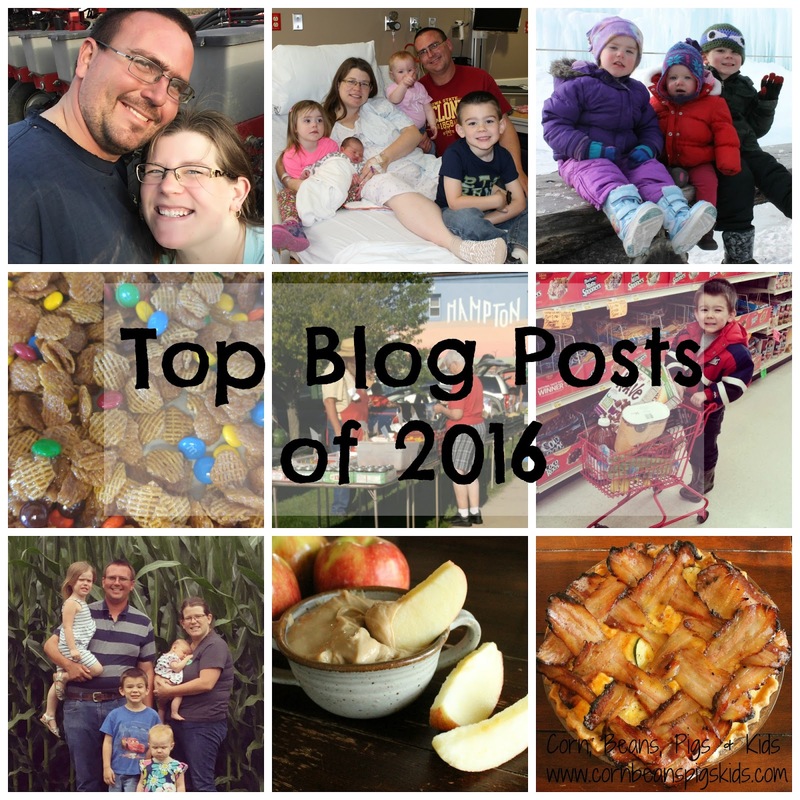 What post was your favorite from 2016? Did you discover any new posts from the top 2016 lists? If you want to see more "top lists" recapping 2016, check out my #2016bestnine on Instagram or my Facebook page. Remember to Comment for a Cause! This past Sunday was our Children's Christmas Program at Church. Mr. K was a shepherd, Miss A was an angel and Miss R got to be Baby Jesus. It was a cute program where some our church's confirmation students walked through the snow and were lead to the manger. The program reminded us all to walk with God and that He shows us the way. My Farmer and I work hard to teach our children about Jesus and to have our family walk with Him. 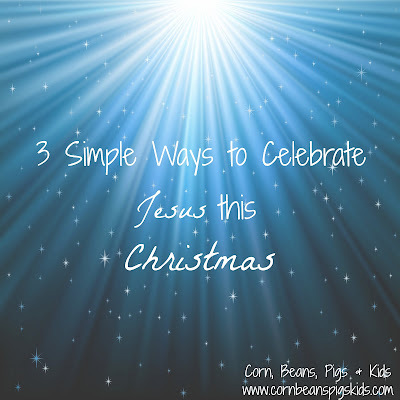 I thought I'd share three simple ways we focus on Jesus every Christmas at our house. Three Gifts - Jesus received three gifts from the Wise Men after His birth, so we honor this by giving all of our children three gifts. We give them one article of clothing, one book and one toy or activity. Besides doing this for our kids, I also practice this for our nieces and nephews, and our kids for their birthdays. It is an easy way to think through gifts, not go overboard, and to keep in mind why we're getting gifts in the first place. Celebrate Jesus's Birthday - Celebrate Christmas the same way you would celebrate anyone else's birthday. 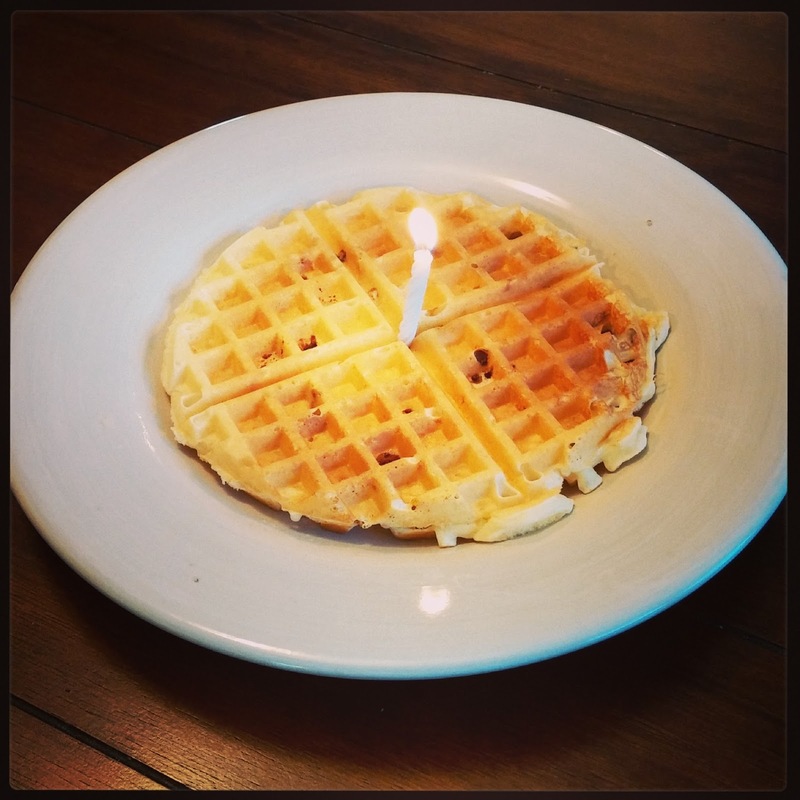 For us, that means starting our day with Birthday Waffles and singing Happy Birthday. Bring in those birthday traditions into your Christmas traditions to help everyone focus on the reason for the season. So how do you celebrate Jesus at Christmas? I'd love to learn some more ideas. Be sure to Comment for a Cause and to remember the Reason for the Season this year. The holiday season is a joyous time for many - celebrations with family, special treats and dinners, and presents under the tree. It is easy for me to take all of this for granted, but for some, they don't have a support system and money can be too tight for those special treats, dinners and presents. So My Farmer and I joined other pig farmers from across the country and paid it forward by donating holiday hams to families in need. We decided to reach out to our local Crisis Intervention Service and help a couple of the families using their services. Our friend Katy made us aware of the needs of the Service Center after doing a service project for them last month. 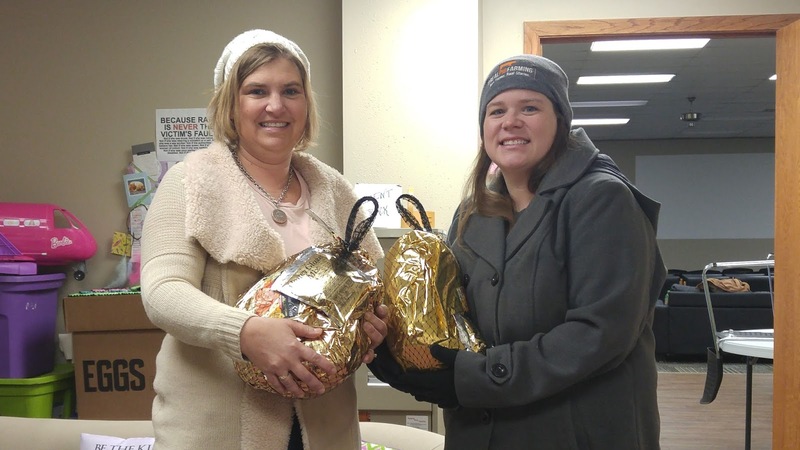 It means a lot to us that we were able to donate holiday hams to two families that are clients of our local Crisis Intervention Service, both after struggling with domestic violence. The director let us know how much each of these families appreciated the hams, as they both have large families and are not receiving any support from the abusers. Knowing these families are now able to celebrate and feed all of those growing bellies means a lot to us, as those are two things we care about for our own family. Our family, and other pig farmers from across America, encourage you to pay it forward and give a holiday ham this holiday season. Who would you like to give a holiday ham to? Remember to Comment for a Cause. Those that know me, know that I'm quite the eggnogaholic this time of year. I mean, I even Instagram and Tweet about it. 😉 To be specific, I like just a simple glass of AE Dairy's Classic Egg Nog in a festive glass or even straight from the carton. Nothing added or spiked, just straight. I mean why mess with a good thing. So, since I am such a big fan of Egg Nog it was mandatory that I develop an Egg Nog Cookie recipe. 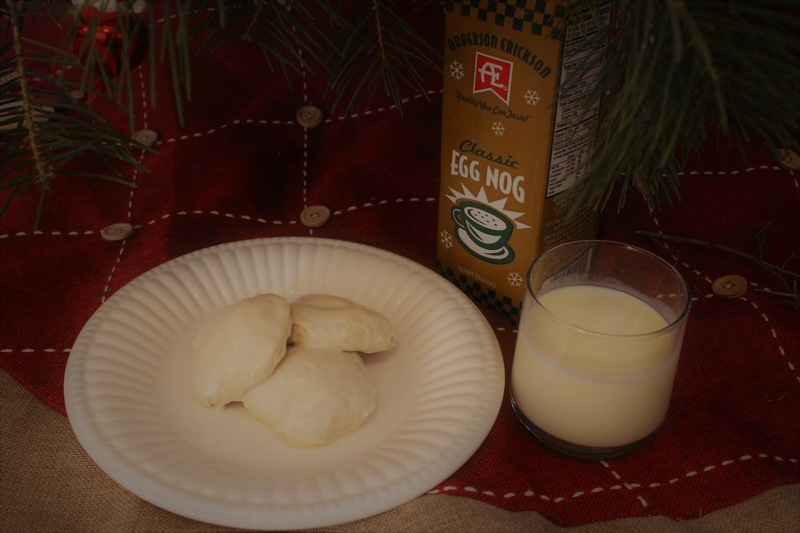 This easy Egg Nog cookie brings out the natural flavors of the egg nog into a light and pillowy cookie. Stir the flour, baking powder, sugar, cinnamon, nutmeg and salt together. To the dry ingredients, mix in butter with a hand mixer til it forms small crumbles. 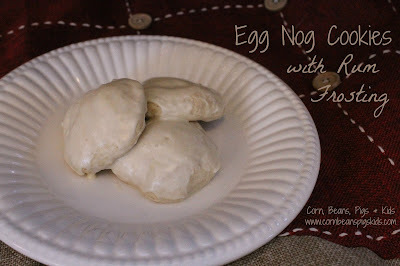 Then add the Egg Nog and mix til it forms into one large dough ball. You can roll out the dough or take scoops of the dough. Make sure you roll out or flatten your cookies because they will rise (and become pillowy soft 😉) in the oven. Bake the cookies at 375ᐤ F for 10 minutes. Recipe yields 2 dozen cookies. While the cookies are baking, make your Rum Frosting. With your hand mixer mix the butter, rum and vanilla. Then mix in the powdered sugar til it forms crumbles. Add 1 tablespoon of Egg Nog at a time until you reach the consistency desired. I like to dip the top of the cookies into the frosting. 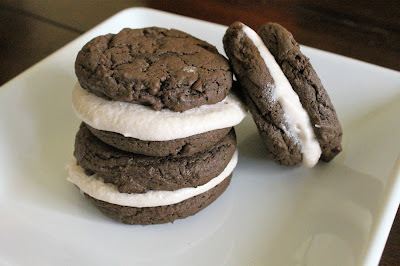 You can also drizzle the frosting or use a piping bag to fill the frosting in the inside of the cookie. With the frosting, I recommend keeping these cookies in cold storage. Doesn't this look like the perfect combination for Santa! *I received a discounted rate to facilitate my review. I love how you can get a subtle smell of the Christmas Tree as soon as you open our house door. I love how going to get a Christmas Tree is a family tradition of ours. And I love how it is a way to support a local farmer, as well as our local economy. 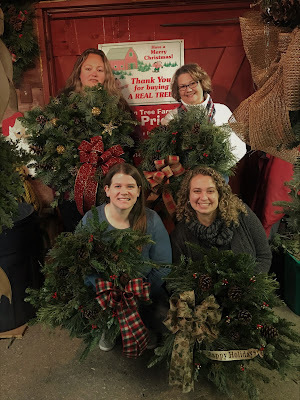 In November a few of the North Iowa Bloggers and myself traveled to the Carlson Tree Farm located in rural Coulter, Iowa (and only six miles away from my house! ), for our annual Christmas Wreath workshop. While at the Carlson's I got to talking to one of the owners, Cathy Carlson, about their harvest season. 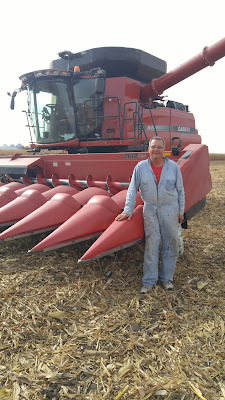 When I think of harvest, I of course think of fall when we harvest our corn and soybeans. But for Iowa's Christmas Tree Farmers, harvest time is Christmas time - mid-November through mid-December. Christmas Trees are grown in all 50 states and there are around 100 Christmas Tree Farms in Iowa. Every year there are around 39,500 Christmas Trees harvested in Iowa. While I get to harvest my corn and soybeans five to six months after planting, Christmas Tree Farmers have to wait six to twelve years before being able to harvest the seedling they planted. One interesting thing I learned too was that for every harvested tree, Christmas Tree Farmers plant two to three replacement seedlings. Now why do they do this? Well, not all trees survive til harvest and some don't grow into the ideal look that everyone wants for their Christmas Tree. 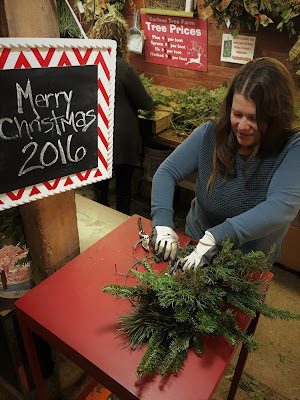 This is where I think the Carlson Tree Farm has gotten innovative and has really captured a niche experience, Christmas Wreath workshops. 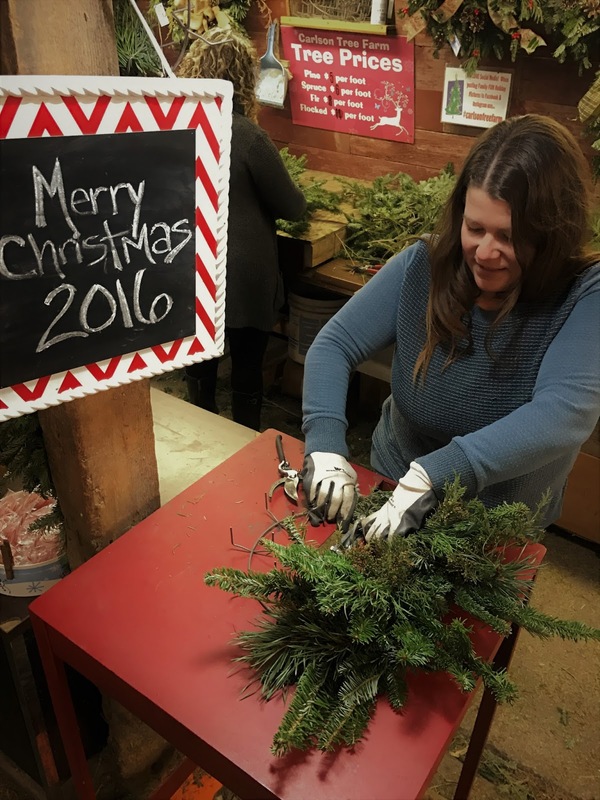 By the end of this week, the Carlson Tree Farm will have led around 300 Christmas Wreath workshops. Participants are able to come in, use the scrap branches (those trees that aren't going to make it as a large family Christmas Tree) from a few different breeds of Christmas Trees to create an unique wreath. You are also able to choose from the wide variety of decorations and adornments to customize the wreath. Besides creating your own one of a kind wreath, the workshops are a great excuse to get together with friends. Now, if you aren't able to claim one of the coveted workshop times, Carlson Tree Farm makes other wreaths that are available for purchase throughout the season. What's your favorite reason to buy a real Christmas Tree? Remember to Comment for a Cause! Tonight My Farmer and I get recognized as a finalist for the Iowa Farm Bureau Federation's Young Farmer Achievement Award. This recognizes young farmers, ages 35 and under, for their growth and progress of their farm and leadership achievements through the start of their career. We are both honored and humbled to be finalist this year and we can't wait to find out tonight how we place! Being a finalist for this award wouldn't be possible without our farm family. We have been very fortunate to have such a great support system behind us. Both of our families, neighbors and community members have backed us in different ways. I wanted to recognize a couple members of our farm family to say thank you. We would first like to thank my father-in-law. He is the one who gave My Farmer the foundation and inspiration to farm starting at a young age. He also helped My Farmer get the resources needed so he could build his pig barns in college. Today, we work daily with each other. As My Farmer describes in the video, we farm in parallel with each other; while it isn't a partnership, we trade labor back and forth, as well as share equipment. Working with an established farmer, like my father-in-law, has been a huge asset for us as young farmers, as capital can be hard to get initially. I also know that my father-in-law works hard to give us the opportunities to succeed, just like we as parents are now doing so for our children. Next we'd like to thank our neighbor, friend and landlord Merlin. Merlin has been a long-time family friend and neighbor. I can't say enough of how great a man he is. When My Farmer and I were dating Merlin was one of the first people I met from the community. We instantly connected. I think at some community events early on some people wondered "who is that girl with Merlin?" rather than "who is that girl with My Farmer?" 😉 Merlin too wants us to succeed. Besides helping us out seasonally with field work, he is also one of our landlords that we rent crop acres from. Most importantly, he really is like family. He is like an extra grandpa for our children and we do fun things outside of the farm with him like going to Nut Frys, Church and Saturday Night Pizza. The last member of our farm family I want to thank and share with all of you is Rusty. 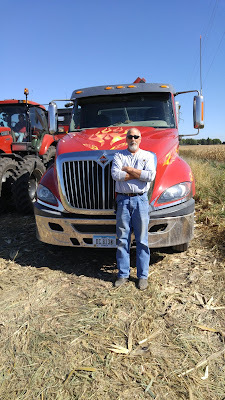 Rusty is one of our long-time farm workers and I don't know if it is his favorite job, but it is probably the job he does the most, and that is drive semi, like he is seen standing in front of here. The thing I appreciate the most about Rusty is his hard work ethic and fun attitude. Things can get stressful on the farm, especially during our busy seasons of harvest and planting, but Rusty knows just what to do calm everyone down and make everyone laugh. I guess you could say that Rusty helps keep our whole farm family sane during tough times. Do you have extra "family" members or a "tribe" that helps you succeed? Remember to Comment for a Cause! It's the start of a new month and time for another great blog party to start! Before we get into this month's Country Fair Blog Party, Jan from the Tip Garden and I would like to thank everyone for your comments last month on the direction we should take with the blog party! The winner of last months Holiday Gift Bag was chosen via Rafflecopter... and drum roll please... The winner is: Julie Raye-Rodriguez!! Jan will be contacting you via email to get your shipping address to get your gift bag in the mail. Congratulations once again! As for 2017, What Comes Next? 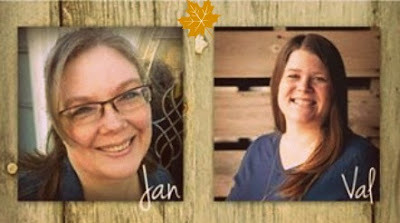 Both Jan and myself joined in as co-hosts to share the load with others as a group of bloggers and we now find ourselves just too busy to run it just by ourselves, or alone as individuals. So very reluctantly, it has come time to let it go. Not totally goodbye: Now while Jan and I are both going to take a break from the Country Fair Blog Party after this month, we both still enjoy hosting blog hops. We have some ideas floating around on maybe some special holiday or seasonal parties we might lead in the future, and if and when we dream up and take action on something new, we plan on inviting all of you. Thank you for your support! We have the best bloggers here at the Country Fair Blog Party! The friendliest, most caring, and willing to share and uplift each other. We are grateful for you coming back month after month and sharing your life with us. We cherish not just the networking but relationships built through this Blog Hop! Delightful Repast's Pumpkin Bundt Cake. Both of these desserts look perfect to share with family over the holidays! Congratulations to both Jean and Carlee! Thanks to everyone that joined our blog hop last month, and I can't wait to see what great posts get linked up to the final Country Fair Blog Party. Country Fairs are all about food, family, friends, farming, animals, arts and crafts, canning, baking and more. And that is what our our blog hop is all about too. Feel free to join our Country Fair by linking up to 3 of your posts. This blog hop is a great opportunity to check out new blogs, and if you blog yourself, have your posts reach a new audience. Be sure to visit some other party goers and let them know you are stopping by through the Country Fair Blog Party. 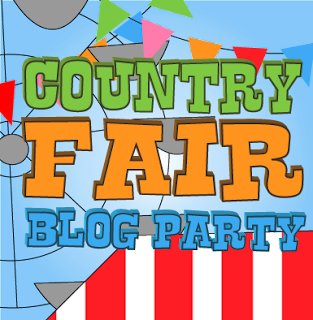 We're excited to see everything you share for this final Country Fair Blog Party. Jan and I would once again like to thank you for linking up over the last couple of years. What is your all-time favorite Country Fair Blog Party post you read? Remember to Comments for a Cause! It's November 1st and time to talk Comments for a Cause! 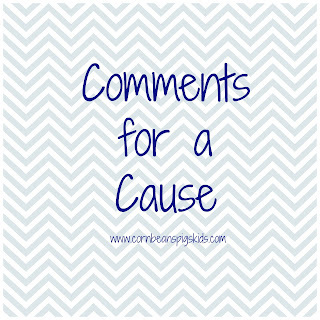 In the month of October I had 28 comments, equaling a $14 donation to My Stuff Bags Foundation! This money will go to helping children in crisis centers and foster care have their own personal items. In the month of November I'm looking forward to helping some Iowa bakers and their efforts to send cookies to troops overseas by donating $0.50 for every comment made on my blog to Iowa Cookie Crumbs. Last December I read an article about a group of Iowa bakers that sent more than 30,000 cookies to U.S. military personnel stationed overseas during the holidays and I knew I needed to highlight them as a future Comments for a Cause recipient. If you've been reading my blog for awhile you know that I have a sister in the Army National Guard and a brother-in-law who was in the Marines and Marine Reserves. Needless to say, anything to support the troops means a lot to me, because I know how much it means to our soldiers, especially when they are deployed. And since Veterans Day is celebrated during November, and I knew there would be a lot of cookie baking in preparation for Iowa Cookie Crumbs's holiday shipment, I thought this month would be the perfect time to showcase their compassion and appreciation for our military. The Iowa Cookie Crumbs was formed by Abbie Crawford, of Southwest Iowa, nearly ten years ago and they not only send cookies to our troops during the holidays, but each month all year long. In fact, last month the group hit the milestone of baking and sending over a million cookies! All of the boxes of cookies are shipped to individual service men and women. Names are collected through Treat the Troops, a larger network that the Iowa Cookie Crumbs works through. The Iowa bakers do send boxes to local soldiers, based off of requests, but a majority of their cookies are sent to soldiers not directly from the area. So help me, help this group of dedicated bakers by commenting all month long so we can help cover some of the shipping costs of all of these cookies! ***If you live in the Council Bluffs area, you can personally help by attending their holiday cookie packing day on November 15th at Emanuel Lutheran Church. *** What is your favorite cookie? Remember to Comment for a Cause! Before we get into this month's Country Fair Blog Party. Jan from the Tip Garden and I would like to share about some changes coming to our Blog Hop! Big Changes! 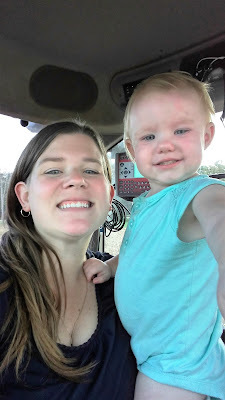 As you may have noticed Nicole from A Kansas Farm Mom, and Laurie, from Country Linked, have made the hard decision they need to take a break from blogging and concentrate completely on family and farming. We completely love and support them and their decision, and send them our best wishes! The Future? Jan and I will be running the County Fair Blog Party through the end of the year, and we are looking to figure out where we go now. If we continue as the Country Fair Blog Party, or relaunch in a new direction. Not just a new name, but a new format altogether. This is where we turn to you and ask for your input! Here's what we do know: We do love hosting a blog link up party! A monthly link up is what we can handle. Here's what we need input on: If we did change formats would you give us your thoughts on them in the comments section? We will be using your feedback as we make a decision. Themed Link up: Keep a regular monthly blog party, but if we changed the format to a theme. How do you feel? General, Seasonal, Monthly: Any posts that would fit for that month. Example, the month of May might be anything from Mothers day, graduations, Spring foods, Memorial day. Specific: Examples, Halloween, Thanksgiving, Winter Holidays,Valentines, etc. Step away from a regular link up and host fun "link up" weeks and have you all join us as Blogger Link up Hosts, onto your own blogs! Examples, seasonal foods or holidays, Mothers day, Valentines, Easter, etc. and bloggers would get to link up their post onto the link and get it posted onto their own blogs, as well and share it too for the exposure! This would mean you'd be joining us as hosts! We could always "generalize" the theme a bit too, like "Thanksgiving" or "Autumn Recipes" to widen our base of bloggers who have posts to share. 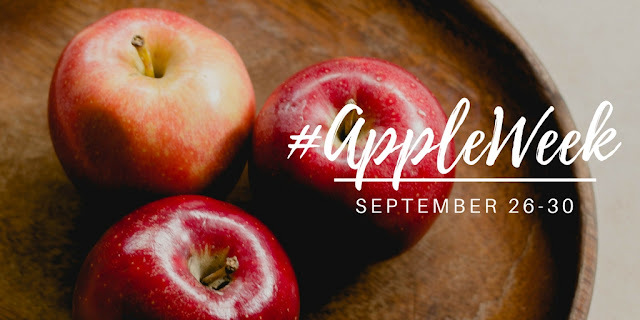 Going to this time of link-up would be similar to the #AppleWeek I participated in, in December with our Blue Ribbon Winner Cooking with Carlee. This themed link up is a fun because you get to focus your own recipe/post on your own blog, but join in as a host on a link up at the same time without doing all the work of a party host! You just need to do a bit of work with us to get the link to us and then get some code into the bottom of your post so all the other links show up, underneath your main recipe! Like your own little blog hop! Other? Do you have any other ideas or thoughts we should consider? To Thank you: We will be giving away a Holiday Gift Bag to one lucky blogger who shares their thoughts in either of our comment sections! Link up at least one blog post to our monthly link party. Leave us a comment in our post comments with your thoughts on where we might take the future of Country Fair Blog Party. After leaving a comment, click on the Rafflecopter button to enter the giveaway. Giveaway ends midnight November 25th, 2016. Winners will be chosen at random via rafflecopter. We will announce the winner in our December 1st Country Fair Blog Party Post. We hope to take all your thoughts, along with our own, and make a decision. both individually and together; and we hope to have an announcement if possible for the December Link Up! 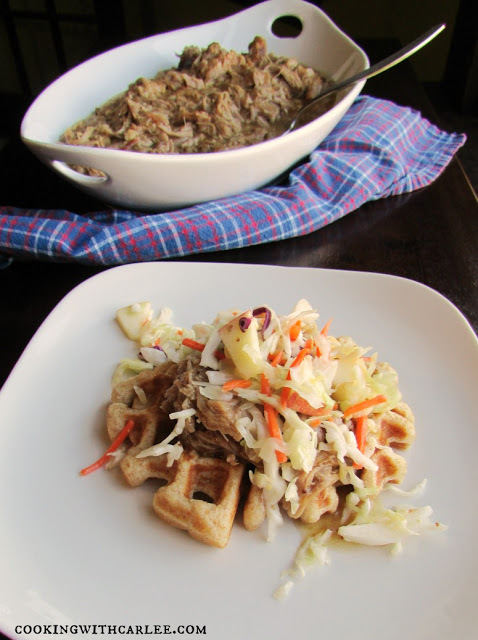 Ok, now that I have shared about the future of the Country Fair Blog Party, lets quickly review last month's Country Fair Blog Party by sharing our most viewed post from the link-up, Cooking with Carlee's Slow Cooker Apple Cider Pulled Pork. We're excited to see everything you share, along with your input on the future of the Country Fair Blog Party this month! Besides sharing your ideas for the Country Fair Blog Party, be sure to also comment what your favorite link from this month's Country Fair Blog Party is. Whichever post is mentioned the most in the comments will receive my "Readers Choice" Blue Ribbon next month. Remember to Comments for a Cause! Last week on Twitter I shared that "It's the most, wonderful time, of the year" because Anderson Erickson Dairy's Egg Nog is at the grocery store. All of AE Dairy's versions of Egg Nog are released at the end of October (I know this because my birthday is at the end of the month and I'm such a big Egg Nog fan that I've received cartons as birthday gifts...) and their other seasonal milks, which debuted last year, hit the store shelves earlier this month. Seeing these "holiday" milks in the grocery store makes me excited for the approaching holiday season and in the mood for baking! Once I saw AE Dairy's After Dinner Mint chocolate milk hit the shelf, I was inspired to create a tractor friendly treat with it. I love to bake, and especially for the holidays, but with my days spent harvesting corn and soybeans, I had to figure out something that was quick, delicious and easy enough to eat while traveling down the field at 3 mph. My first thought was a cookie. Cookies are always a hit during the fall (and for Christmas) because they're easy to eat. But how could I use this chocolate milk, that has a mild mint undertone, in a cookie? Ding, Ding, Ding - frosting! Well no one wants a frosted cookie while driving a tractor or combine... but what if the frosting was sandwiched between two cookies??? Aha! Homemade Chocolate Mint Oreos. Start by making your cookie batter. Mix the cake mixes, eggs and oil with a spatula till all ingredients are fully incorporated. This will be a thick batter, so don't give up on it - it will come together, I promise! Bake the cookies at 350 degrees for 9-10 minutes. After you take them out of the oven press them down to flatten them. Let them rest a couple minutes before transferring them to a cooling rack. While the cookies are baking you can make your frosting. Blend the butter and shortening together with a hand mixer. Add peppermint. Then add the powdered sugar. Finally, add AE Dairy After Dinner Mint chocolate milk to the mix a tablespoon at a time until it is fluffy. 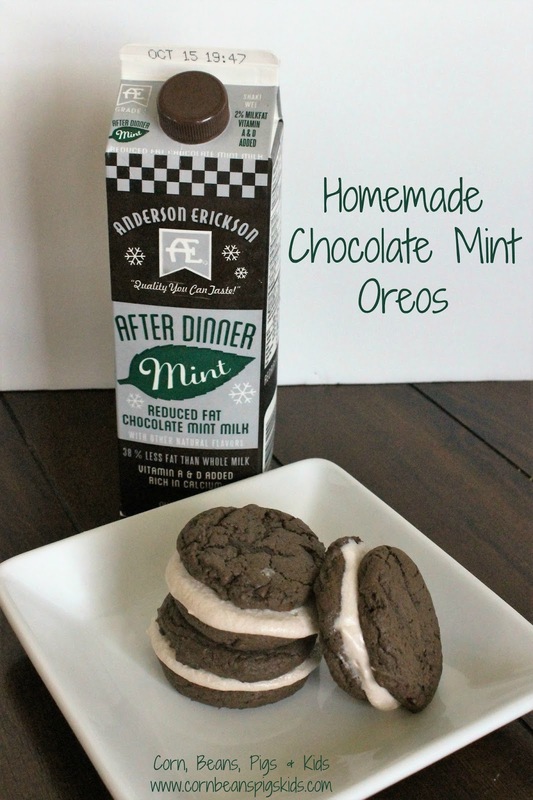 Have you tried AE Dairy's After Dinner Mint Chocolate Milk before? I'm not even a huge fan of chocolate and mint, but this milk has the proportion of chocolate and mint just right that everyone can enjoy a glass. This milk would also be great milk to warm up for hot chocolate! Remember to Comment for a Cause! The kids and I are kind of a packaged deal. Wherever they go, I go and wherever I go, they go. I guess that is what happens when you're a stay at home mom. So when it comes to the time of the year when I am out in the field daily, the kids come along with me. This is fun (and a little crowded) and I know we are making memories that will last a lifetime. Many people have asked what do the kids do all day out in the tractor? We read a lot of books, we play with tractors, dolls, stuffed animals, etc. Each kid has a tractor cinch sack bag that they take out to the field with them that includes their favorite things to play with and a couple snacks, a juice packet and their water bottle. Can you tell they're siblings? Who do you think looks the most alike? Remember to Comment for a Cause! Harvest is a busy time of the year on our farm. The days start early and the nights end late. We work as hard as mother nature allows us to bring in both our corn and soybean crop. When I find myself at home I play "catch up" with all of the house work and try to cross off a couple things (or at least one) from my to-do list. 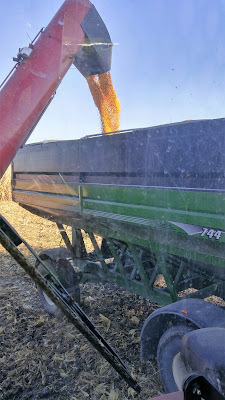 And since today is Friday, I thought it'd be a fun excuse to ignore my messy living room and breakfast dishes in the sink and write a Harvest Happenings blog post. Harvest this year has been going a little slow and to tell you the truth, has been full of the unexpected. We normally like to start harvesting our soybeans and then switch to corn. 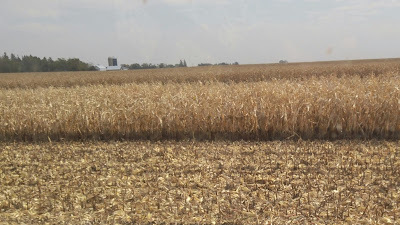 But this year, due to flooding in September, I think we've switched back and forth between soybeans and corn four times because we're simply just going to fields that are dry enough to be worked in. And you might not think switching back and forth isn't that big of a deal, but it takes time and slows down harvest. We have to completely clean out the combine, catch cart, wagons, auger, etc. and switch the combine's head between corn and soybeans. We store and sell our corn and soybeans separately so you don't want corn mixed in with your soybeans and vice versa. has to be cleaned out when we switch between corn and soybeans. And talking about that September flooding, that is causing concern for a couple different reasons. First, is that the ground is still not completely dry and very soft. While taking out the crop, we have to be careful while driving in the field so we don't get stuck. We also are waiting to do any fall tillage work because things are so wet that we'd end up just compacting the soil more, rather than breaking it up which is the benefit in the first place. The second reason for concern is the crop health and stand. Many, if not actually all, of our corn and soybeans were in standing water at some point. This has caused our stalks to deteriorate and the chance of fungus growing on our plants to increase. Can you see that line along the bottom of the corn stalks? That is a water line from the flooding we had in September. But this fall hasn't been all gloomy. 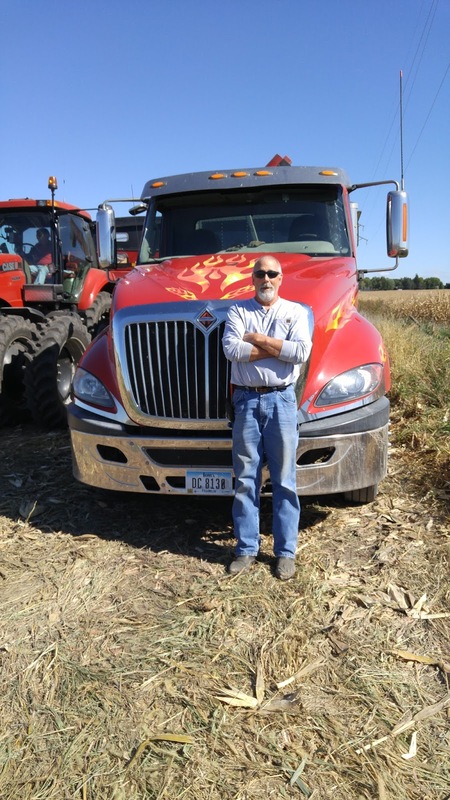 Part of the unexpected of this year is that our crops are yielding average to above average. That makes the increase stress of harvesting in these non-ideal conditions a little better to handle. Also, my favorite part of harvest is always the time spent making memories with our family. Sometimes it gets a little crazy having our kids out in the field and so involved during harvest, but it is so much fun too. How lucky are our kids that they get to be with their parents and grandparents everyday?! So this is a little bit of everything I've been thinking about, stressing about, and enjoying lately. I also did my first "Farm Friday Facebook Live" from the tractor last week and I hope to find time to do it again today. 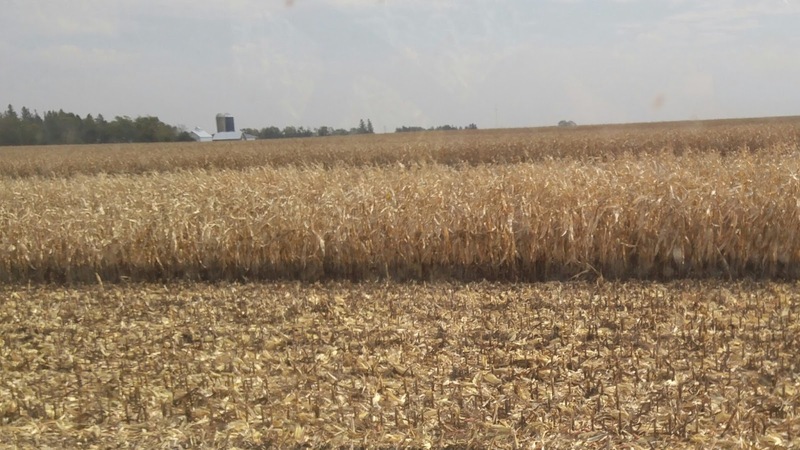 What questions do you have about corn and soybean harvest? I'll try to answer those questions in my next Facebook Live and on here through my next Harvest Happenings. Remember to Comment for a Cause! 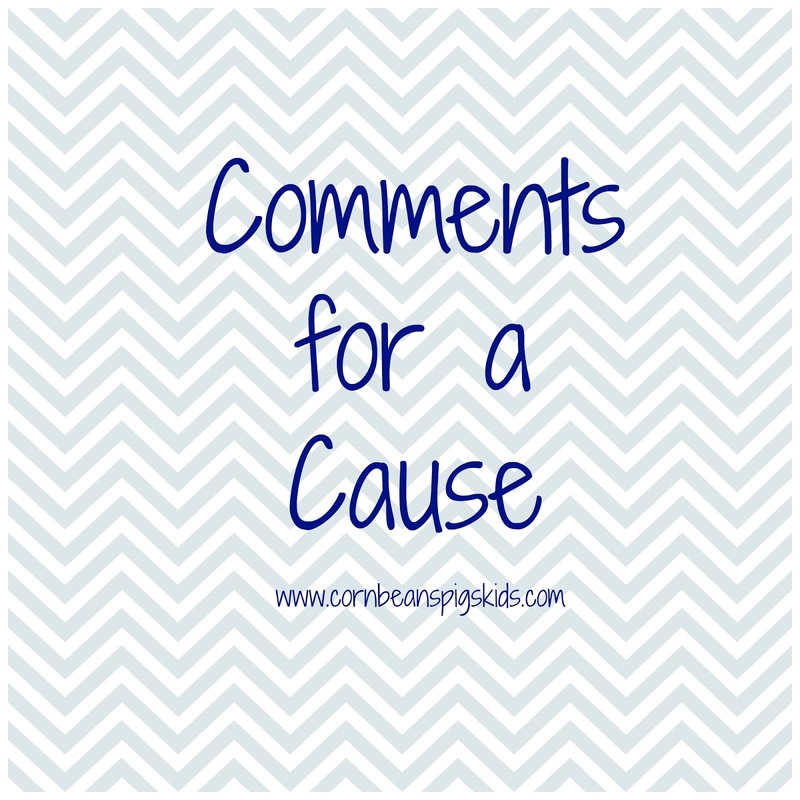 It's October 1st and time to talk Comments for a Cause! In the month of September I had 92 comments, equaling a $46 donation to Make Our Day which I'm excited is going to be matched by another donor! Our combined efforts will cover 8 weeks of classes and tutoring for one of the Thai children. Isn't it amazing how we can make such an impact in just a month of commenting! In the month of October I'm looking forward to making an impact for children in crisis centers and foster care nationwide by donating $0.50 for every comment made on my blog to My Stuff Bags Foundation. 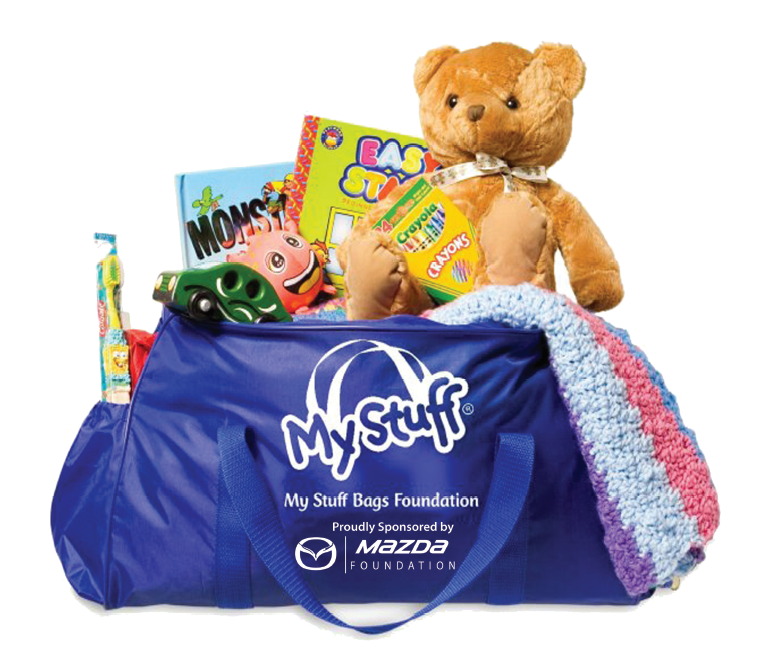 My Stuff Bags goal is to provide a My Stuff Bag filled with new belongings to each of the nearly 300,000 children nationwide that enter crisis shelters and foster care each year with nothing of their own. These children are often taken from their homes, or lack there of, with no possessions. The My Stuff Bag is a cute, individual duffel bag filled with essentials that are theirs to keep like clothing, toys, a stuffed animal, school supplies, toiletries and a blanket. One neat thing is that most of the blankets are handmade from people across the country. Children in all 50 states have benefited from My Stuff Bags. I was surprised, yet happy, that they serve 22 agencies in the state of Iowa. I have a special place in my heart for any child that has to be and needs to be moved to a new home, and I'm so pleased there is a group like My Stuff Bags that gives those children hope for their new phase of life. So help me, help these children not only get their own stuff but also an outlook on life, by commenting all month long. Have you ever heard of the My Stuff Bags Foundation before? What other programs do you know that help kids in foster care or at crisis centers? Remember to Comment for a Cause! During last month's Blog Party, Gluten Free A-Z's Baked Ziti The Way Grandma Made It was the most viewed post from the link-up! 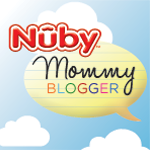 Congratulations to Judee on getting the most clicks and receiving a Country Fair Blog Party Blue Ribbon! 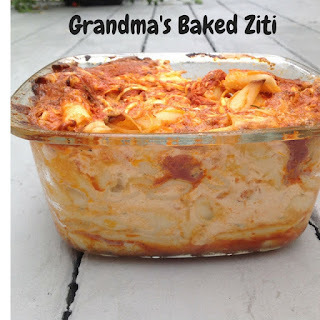 Her Baked Ziti sounds like a perfect dish to warm up with this fall. My Readers' Choice Blue Ribbon goes to The Frugal Pantry's Oreo Bars. My readers, and I, thought this recipe looked too good not to try. Plus, it is a cake mix recipe. 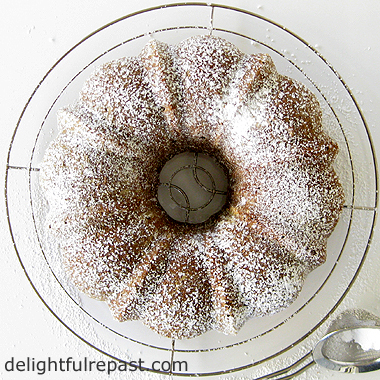 I think cake mix recipes are always fun to make and always seem to be soft and chewy! And my final Country Fair Blog Party Blue Ribbon goes to Vickie's Kitchen and Garden's Donuts from a Can of Biscuits. This wasn't only one of my favorite recipes, but actually was in a three-way tie for the second most clicked on post from last month's link-up. This is a tried and true recipe from Vickie that she made for her kids and now her grandkids. Today I'm sharing one of my go-to, quick snacks - my 1 Minute Caramel Apple Dip. This is a recipe I learned from my mom how to make when I was a kid and that I plan on sharing with my kids how to make once they're old enough to handle a hand mixer. Mix ingredients together with a hand mixer until smooth. Store in the refrigerator. Serve with apple slices or your favorite fruit. And to show how easy and fast this dip is, I'm going to do a Facebook LIVE video today at 3pm CST showing how it literally take 1 minute to make. I hope you hop over to Facebook and watch today! So, which Apple Week recipe are you most excited about that I shared this week - my Harvest Brats with Apple Slaw, my Apple Brown Betty, or today's 1 Minute Caramel Apple Dip? Have you checked out some of the other Apple Week posts? Which one of those are you looking forward to making? Remember to Comment for a Cause!